John Balkwill is a book artist and printmaker residing in Santa Barbara, California where he operates The Lumino Press, which is dedicated to producing handprinted and bound limited edition books as well as prints. He received a Bachelor of Arts degree from The University of Norte Dame and a Master of Fine Arts degree from The Institute for the Book Arts at The University of Alabama, where he studied under the internationally recognized private press printer Gabriel Rummonds. He also studied at St. Mary's College in Rome. Balkwill learned the techniques of wood engraving from John DePol, the dean of American wood engravers, and studied Japanese woodblock printmaking with Akira Kurosaki, one of the most respected contemporary Japanese printmakers. Prior to establishing The Lumino Press in Santa Barbara, Balkwill taught book arts at The University of Nevada, Reno where he was also Assoc. Director of The Black Rock Press and produced limited edition projects in collaboration with numerous writers and artists including Pulitzer prize-winning authors, Gary Snyder and Daniel Boorstin. As a printmaker Balkwill works primarily with relief printing methods. 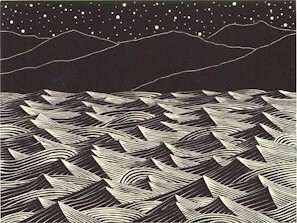 He has produced wood engravings and relief engravings on landscape subjects, notably the series Ten Views from Lake Tahoe and the Finding the Space suite, inspired by Gary Snyder's poetry. He has also done numerous photomontages and collages, and a number of which have been handprinted from photomechanically produced relief plates in small editions. Balkwill has also exhibited watercolor paintings. He is currently experimenting with pointillist techniques for producing polychromatic relief prints as well as relief engravings incorporating mythological figures into the imagery. Balkwill's graphic art and limited edition books have been exhibited widely and acquired by numerous private and public collections. His work has recently been exhibited at the Book Club of California in San Francisco, the University of Michigan Museum of Art, Occidental College and the Nevada Museum of Art. His graphic art is in the permanent collections of Stanford University, the Library of Congress, the University of Michigan, Brown University and the Book Club of California among many others.